What's better than a porch swing? How about a swing bed where you can settle in for a long nap and fall asleep with the smells and sounds of your landscape lulling you into perfect relaxation? 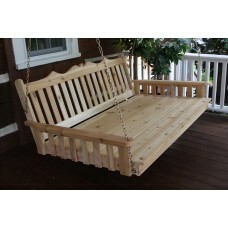 Our full selection of swing beds will let you turn your back yard into a dreamy, lovely getaway. Choose from elegant, lovely styles by shopping below, and enjoy the maintenance free experience of swing beds made of outdoor-ready hardwoods. 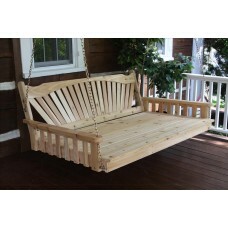 Timelessly beautiful fanback porch swingbed made from red cedar wood. 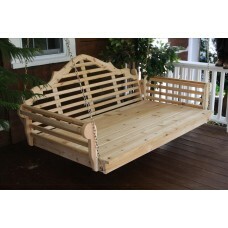 Elegant Royal English cedar swingbed for the front porch. When you get your swing bed it is vital for you to choose the proper swing bed cushions. This will give you a truly sublime naptime experience. Each of our swing beds gives you the option of choosing cushions designed to fit the bed exactly. We have them in both four inch thicknesses and two inch thicknesses so that you can enjoy the level of comfort that you truly deserve. You can also take advantage of our free shipping which makes purchasing your very own swing bed into a truly stress free experience. Don't just build an outdoor room. Build an outdoor bedroom where you can nap your cares away, rocked gently to sleep just as if you were a baby again. 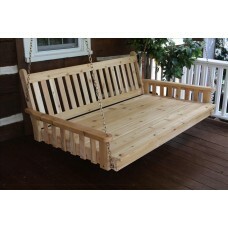 Order your new swing bed today and get ready to enjoy a fantastic experience that you'll truly love.